Pedestrian Knockdown. T.E., a man in his early 70’s, retired, was crossing an intersection in the crosswalk, when he was struck my a Metro-Bus making a right turn. He was transported, by fire rescue, to Jackson Memorial Hospital Trauma Center with injuries to his left knee. He came under the care of Dr. James Mayoza, an orthopedic surgeon. MRI to his knee revealed a lateral meniscus tear which led to a total knee replacement. Defendant County claimed the knee injury and surgeries were not related to the accident, based upon pre-existing osteoarthritis (aging). The claims were denied by the County. T.E. hired Lipcon & Lipcon, P.A., a Miami law firm that specializes in personal injury litigation, after two other firms declined to represent him. 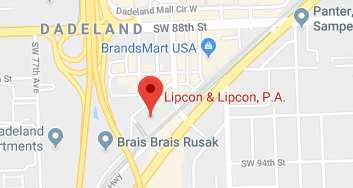 Lipcon & Lipcon promptly filed a lawsuit against Miami-Dade County, in addition to demanding payment, in full, of T.E.’s uninsured/underinsured insurance limits from his automobile policy. After almost a year of litigation which included numerous depositions of witnesses and medical experts, the County and T.E.’s insurance carrier both tendered the full amount of their policy limits (just days before trial). David Lipcon stated that this isn’t the first time he has represented a client that was declined representation from other lawyers who do not have adequate experience analyzing personal injury claims. After meeting with investigators and reviewing the medical reports, he felt confident he would achieve a good result for T.E. and his family.